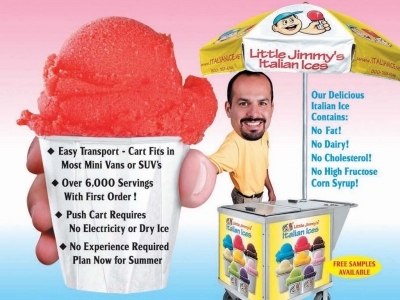 Little Jimmy's Italian Ice is a frozen dessert that everyone loves. Our Italian ice contains no dairy, fat or high fructose corn syrup. We offer entrepreneurs a start up package that includes 40 cans of our Italian Ice, a pushcart, paper supplies, advertising and marketing materials, all for $4,495.00. Delivery is included to most US destinations.